This Easter, why not make baskets filled with fun Easter gifts instead of chocolate bunnies and sugary treats. Chocolate is gone quickly, leaving kids with nothing but a tummy ache and adults with a few extra pounds. Gifts, however, can be enjoyed long after Easter is over. To decorate hard-boiled eggs easily, dye the eggs one solid color, glue small plastic squiggly eyes from the craft store on the egg and let kids ad a funny mouth, nose and eyebrows with markers. For children who will be attending family Easter dinners, church services, or having Easter pictures taken, clothing, jewellry or accessories make ideal Easter gifts. For boys, a tie or a watch makes a great gift for them to show off. For girls, an Easter hat, purse, or jewellry will be a treasured gift. 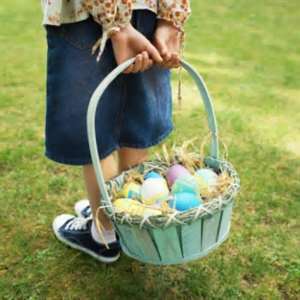 Other good gifts for Easter baskets include books about Easter, plush bunnies, play dough, colored chalk, bubbles, coloring books or anything small enough to fit in the basket. There are plenty of inexpensive Easter themed toys, games and movies available that kids will enjoy long after their friends have eaten their last pieces of chocolate. As fun as toys are, kids still enjoy treats. Carrot sticks, yogurt covered raisins and trail mix wrapped in bright cellophane look festive in Easter baskets. For a special treat, make Rice Krispy treats or popcorn balls and shape into egg and bunny shapes. For kids and adults who cannot stand the thought of Easter without jellybeans, try sugar-free jellybeans. They are usually found in the diabetic or diet section of grocery stores. Most kids will never notice the difference. Strawberries or pretzel rods dipped in chocolate offer the chocolate everyone loves, just in smaller amounts. Make Easter a day of fun instead of a day of gorging on candy and kids will learn that not all holidays have to involve chocolate. The best Easter gifts are those that are shared with others. Craft kits that make tote bags, jewellry, mugs, or hats are readily available. Give each child a craft kit in his or her basket and let them invite friends over to create their own Easter masterpieces. Include Easter themed games to play, like pin the tail on the bunny; serve any sugar-free orange drinks and tell the kids it is carrot juice for bunnies. Add a carrot for garnish and use your imagination to create healthy snacks in fun Easter shapes. Parents shouldn't worry abut their kids missing chocolate. There will always be friends and relatives who cannot resist slipping the little ones a basket of sugary sweets for Easter.